See also the Japanese Rectaflex TLR. 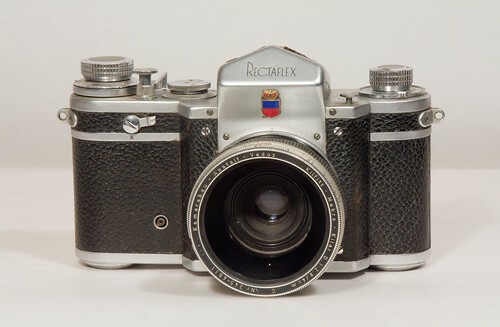 The Rectaflex 35mm SLR is the brainchild of the Roman lawyer and industrialist Telemaco Corsi. After having had a prototype built, based on his ideas, he established the Rectaflex enterprise in Rome. A wooden prototype was shown in 1947, and again 1948 somewhat improved. The venture was rather loosely organised and after some troubled years, the company went out of business in 1955. The Rectaflex is a 35mm SLR camera with a focal plane shutter, having interchangeable lenses and a pentaprism eye-level finder. 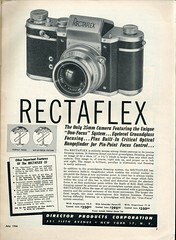 The Rectaflex was in production and on sale in the northern autumn of 1948. It was the first SLR camera to be equipped with a pentaprism. It also had a wide diameter bayonet mount and the chief designer was Telemaco Corsi. The second 35mm SLR with a pentaprism was the Contax S introduced in 1949. 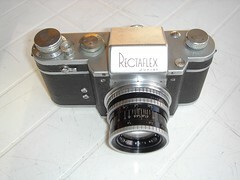 The first prototype of the Rectaflex was a wooden mock-up, with a mirror eye-level finder, giving a left to right inverted image. For vertical pictures, the image was upside down which was a major drawback. The pre-series model was called Rectaflex Standard 947, and it had the pentaprism as well as a focal plane shutter from 1s to 1/1000, synchronised at 1/25. The first production model was the Rectaflex series 1000 (serial number 1000 to 1999), quite similar to the preseries model. The Rectaflex series 2000 (s/n 2000 to 2999) has the split-image device added to the focusing screen. Note that Rectaflex series 1000 and Rectaflex series 2000 were not official designations, but is a way to recognize the variants by way of their serial number. The Rectaflex series 4000 (s/n 4000 to 5500) has no film cutter? and a modified A/R lever. Only the Rectaflex Standard 947 and the Series 1000 had a film cutter, and when the bulk of the Series 1000 was converted to the first series Junior the cutter was removed, the hole in the rewind side top cover was fitted with a plug and the slotted film gate was replaced. The Rectaflex series 16000 (s/n 16000 to 19000) has a triple sync plug and a film reminder under the rewind knob. The Rectaflex series 20000 (s/n 20000 to 23000) has an internally modified shutter and a reinforced bayonet mount. The Rectaflex series 25000 (s/n 25000 to 32000) had a modified shutter to 1/1300, and two sync plugs only. Some of them had a new flattened release button. It is sometimes called Rectaflex 1300, because of its shutter speed, the previous series being called Rectaflex 1000. An interesting feature of Rectaflex cameras with slow shutter speeds was the eight jewel slow speed escapement, possibly the only camera with such a feature. 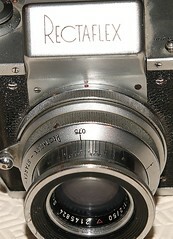 The Rectaflex Junior was a Rectaflex series 1000 transformed with a simplified focal plane shutter from 1/25 to 1/500. The Rectaflex series 1000 had reliability trouble, so an important number (between 500 and 1000) were converted. The Rectaflex Gold was a Rectaflex series 25000 with gold-plated finish and lizard body covering. All were offered to VIPs, among which the Pope Pius XII, Dwight D. Eisenhower and Winston Churchill. The Rectaflex Rotor was a Rectaflex series 25000 with a three lens turret. The estimated production was 200 to 300. In addition, some Rectaflex from various series were independently converted to the Rectaflex Rotor specifications. A special version of the Rectaflex series 25000 existed with 24x32 format and a microscope adapter, for scientific use. After the Rectaflex 25000 the original Rectaflex company went down, and a new Rectaflex company was formed, partly controlled by the Prince of Liechtenstein. Telemaco Corsi did not play any role in it. They launched a Rectaflex 40000, often called Rectaflex Liechtenstein. It had a reshaped pentaprism cover, with the Liechtenstein blason, and other minor changes. The number produced is unknown and it seemed to be plagued by design faults. Some prototypes are known with internal diaphragm preselection. The Recta was a prototype rangefinder camera based on the Rectaflex. It had a focal plane shutter from 1s to 1/1000 and a 39mm Leica mount. Six were produced, with serial number 1001 to 1006. The known standard lens was the Isco Westar 50/3.5. The Recta was designed by Telemaco Corsi in 1953, before the demise of Rectaflex. 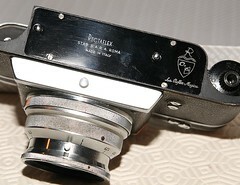 The Rectamatic was the project of an advanced 35mm SLR camera, designed by Telemaco Corsi at the beginning of the 1960s, as a successor of the Rectaflex. RECTAFLEX, The Magic Reflex by Marco Antonetto. Nassa Watch Gallery 2002. (English and Italian Editions,261 pages, Hardcover, profusely illustrated in colour and black and white). In my opinion this is the finest single make camera book ever although it does have a comprehensive appendix about the history and all models of the Italian Gamma Leica copy cameras. A rather sad book but conclusively proving that the Rectaflex was the first commercially successful 35mm SLR with a pentaprism. Rectaflex 1000 serial no. 3472, with SOM Berthiot Flor 50 mm f/2.8, sold at the 24th Westlicht Photographica Auction, on 23 November 2013. Rectaflex 1300 serial no. 30993, with Berthiot Flor 55 mm f/1.5, also sold at the 24th Westlicht auction. Rectaflex Junior serial no. 1343, with Filotecnica Salmoiraghi 5 cm f/3.5, also sold at the 24th Westlicht auction. Rectaflex Rotor outfit; camera serial no. 3507, with Schneider Xenon 50 mm f/2, Angénieux Type R1 35 mm f/2.5 and Angénieux Type Y2 135 mm f/3.5, also sold at the 24th Westlicht auction. Rectaflex Rotor outfit; camera serial no. 1401, described by the auctioneer as a prototype, with Angenieux Type Z2 50mm f/2.9, Angenieux Type Y2 135mm f/3.5 and Tessar 7.5cm f/3.5; sold at the 27th Westlicht Camera Auction, in June 2015. Rectaflex Liechtenstein serial no. 40131 (with interesting Xenon 50 mm f/1.9 with built-in selenium meter); a lot in the nineteenth Westlicht auction, on 28 May 2011. This page was last edited on 6 August 2016, at 09:58.